How to join the Indian Navy? We have previously covered the topic of making a glorious career of serving your nation through the gallantry of the Indian Army (How to get into the Indian Army?). In this article, we will take it further to dwell on another one of the three branches of the Indian Defense, protecting our country over its marine border – The Indian Navy. Yet another honorable career taken on by the men and women in whites, both on and off shore off the coast of India. Recently, women have been included to serve in the Navy on Permanent Commissions (PC) in addition to the long standing Short Service Commissions (SSC) that they could be admitted to before (in departments we will mention below). Due to the lack of proper facilities for women on ships though, most onboard duties are reserved for men. Nevertheless, it is a changing world and we hope to see a greater inclusion of women in every department. In this article, we will emphasize the process of becoming an officer in the Navy, followed by some details on joining as sailors. The basic premise of joining the Indian Navy is in many ways similar to the regulations that determine officer admissions to the Indian Army. Advertisements for vacancies, entrance exams, interviews, and more, are published in all national dailies and especially on the Employment News. You can visit the website – Join Indian Navy – to apply online or choose to obtain the forms and send in your application by regular post. There are two forms of recruitment that have to do with the period you are likely to serve – Permanent Commission and Short Service Commission. Both commissions have a rigorous entry procedure. Here’s how you can expect to be inducted into this prestigious arm of our defense. Three ways – Union Public Service Commission entry, the Direct Entry scheme or the University Entry Scheme. We will elaborate on them a bit more for clarity. The Indian Navy website provides details on the schemes and lets you use this tool to check for your eligibility. Executive whose officers manage and lead ships, submarines and such, in actual warfare. Engineering which as the name suggests deals with technology oriented tasks maintaining and operating equipment on the ships, submarines or naval aircrafts. They also tend to other offshore maintenance responsibilities. Electrical which is a highly responsible and complex field dealing with warfare and its aids, and other complex computer systems that are required to keep the Naval machinery running smoothly. Education department which oversees the training of all personnel and is responsible to prepare them for wartime and otherwise. Medical department, or the Armed Forces Medical Services who serve as medical professionals and physicians in the Navy. AFMS cadet entry occurs either at 10+2 or after a Bachelor’s in Science, upon qualifying a written exam for MBBS announced in January each year. Already qualified doctors, within 45 years of age, can also be granted a Permanent Commission. Dentists, with a BDS degree, can also get Direct Permanent Commission into the Dental Branch of the Navy. UPSC holds examinations twice a year for Permanent Commission entry to the Indian Navy. There are two ways to go about it – The NDA (National Defense Academy)/INA (Indian Naval Academy) entry for 12th standard candidates (or pass outs) with Physics, Chemistry Maths subjects, and the CDSE (Combined Defense Services Examination) for college graduates. There is also a third NCC entry which doesn’t need any examinations. Upon qualification, the interviews are conducted by the SSB (Service Selection Board) in various parts of the country, followed by a medical test by the Indian Navy. All examinations occur twice a year and are announced on all national newspapers, Employment News, and on the UPSC website. Here are some important tentative periods for exam notifications, exam dates, and interviews. NDA and INA Exams for 10+2 (PCM) candidates: Announced in Dec/Jan and Jun/Jul. Exams are held in April and Oct/Nov, while the SSB interviews are held in Aug/Sep and Jan/Feb, for the two cycles respectively. CDSE entry for university graduates: Even valid for B.Tech degree holders. 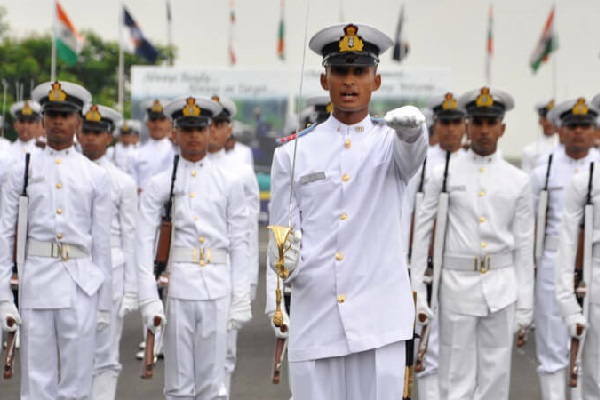 These candidates also have two cycles to attempt each year, and qualified merit list candidates head on for an SSB interview and a medical test conducted by the Indian Navy. Exams are announced in November and July, written tests in Feb/Mar and Oct/Nov, while interviews occur in Sep/Oct and Jan/Feb, among the two cycles. NCC: The third category that falls under the purview of UPSC is the NCC entry. There are no written UPSC exams for this. As long as the age limit of 25 years is met, university graduates (in Science with Physics and Maths), with at least 50% marks and Naval Wing Senior Div NCC ‘C’ with B grade certificates, can apply for vacancies published along with the CDSE vacancy ads in newspapers, etc. Upon a successful SSB interview, they are sent for medical fitness and then training. NCC C certificate holders can also join in the Short Service Commission (SSC). UPSC entry is open for Indian citizens, subjects of Nepal, Bhutan, or Tibetan refugees from before 1962. Women are not eligible under this Permanent Commission category. For other UPSC related information, we recommend this article. These consist of both PC and SSC. Women can enter certain categories of SSC posts. These Direct Entry PC and SSC schemes are usually accompanied by an SSB interview and medical fitness test. Interviewees are shortlisted typically based on their education and percentage scores, Engineering ranks, etc. 10+2 Tech Cadet Entry: Candidates are selected based on their 10+2 PCM scores and undergo an SSB interview to be placed into a B.Tech Engineering course of four years at INS Shivaji/Cochin University of Science and Technology for Naval Architecture. They serve as PC Engineering officers in the Navy. University Entry Scheme (UES): These are final year Engineering students directly shortlisted from various AICTE approved Engineering colleges in India. Upon successfully completing an SSB interview and a medical fitness test, they are placed in various engineering positions in the Navy. Special Naval Architects Entry Scheme (SNAES): Campus interviews, among Naval Architecture B.Tech students, at IIT Kharagpur, IIT Chennai, Cochin University of Science and Technology and Andhra University, undergo medical fitness before joining the Navy as SSC SNAES officers for training. The above sources of Navy induction for Direct Entries are fed into one of the four branches. A few positions, gender eligibilities, and notification timelines are mentioned below. The ads come out as in the other vacancies – in national/regional dailies, Employment News, and Navy’s official website. Executive PC and SSC: These include the following for Graduate entries. Pilot (SSC) for only male candidates. Notifications come out in March and October. Observer (SSC) for both males and females, with ads in March and October. Naval Armament Inspector (PC and SSC) for males only with ads in November and April, respectively. Hydrography (SSC) for males only with notifications in February and September. Air Traffic Control (SSC) for both males and females. Ads in April. Law department is for males in Permanent Commission and for both in SSC. Notifications come out as per vacancy filling requirement. Logistics is for males in PC and for both in SSC. Ads come out in March for the former and in November for the latter. The University Entry Scheme (UES) is also a source for Executive positions in Logistics, General Service (SSC and for males only), as well as Pilots and Observers, and others. Marine Engineering PC and SSC: These include both graduate and 10+2 B.Tech cadets. General Service (SSC) for males only whose ads are released in February and September. Submarine Tech (SSC) for males also in February and September. Technical (SSC) for males in February and September. Various Naval Engineering positions through the 10+2 B.Tech scheme. Naval Architecture (SSC) for both males and females with vacancy notifications in November. Electrical Engineering SSC: These include SSC entries in General Service for males only and Submarine Tech also for males with notifications in February and September. They also absorb candidates from the UES and 10+2 schemes. Education (PC and SSC): Takes in candidates in all fields with notifications coming out through the year. Sailor entry includes recruitment for positions of Senior Secondary Recruit (SSR), Matric Recruit (MR) such as Chef/Steward/Sanitary Hygienist, Musician (MUS), Sports, and Artificer Apprentice (AA). Notifications are posted on daily newspapers and Employment News in Dec/Jan and Jun/Jul every year. There is a written examination in English, Science, Mathematics, and General Knowledge. Besides the regimented training, discipline, and immense skills, obtained in a Naval career, what comes after is also very impressive. During the Naval career, salary depends on the officer grade and can range from about 1-2 lakhs to well over a few lakhs for higher positions. Even trainees get paid a sufficient stipend apart from the facilities that they are entitled to. Upon completion of 20 years in the Navy, officers, as well as sailors, are eligible for a handsome pension for the rest of their lives. Plus, the added advantage of using their Naval skills for civilian jobs, after. So, if you fancy your career’s future in the Indian Defense forces and the honor of being part of the health of our marine border fancies you, tease your mind with the possibility of joining the Indian Navy. Research your options and contact their people for more information on how your situation can match their demands. Here are some related links about administrative, bank and other public sector jobs in India. How to get Bank PO Jobs in India?